In 2012, as we left for early carry-in breakfast at church, I asked the boys what they knew about Easter in the van. One of my sons replied, "I think it's something with candy and a bunny." Even though they were only five, I felt like this was a HUGE parenting fail for me. Now of course at their age, they were not ready for the more gruesome details of the passion, but I was shocked how little focus I had put on this most important holiday. I had outsourced all their Easter education to the children's church hour, which was wrong on so many levels. The manger is much less intimidating than the cross. My son's comment put a spotlight on the fact that that just a few months before I had spent endless hours preparing for Christmas, but not even a full hour preparing them for the reason for Easter, our salvation. As I stepped back, I was convicted that I had three tubs of Christmas decorations, but not one of Easter decor. In December we remind ourselves to see the true "reason for the season" for Christmas, but somehow I let it get lost in the spring beauty of new flowers, plans for gardens, and candy eggs. I think this is a very intentional scheme of the enemy because the manger is less intimating that the corss. I tried this week to focus as much, if not more, onto Easter as I did on Christmas. Every night our bedtime bedtime reading is a Bible Reading. Younger children might need to color on one of the Holy Week coloring pages while you read. It was rejuvenating for ALL of us as we focused our attention on our Savior. All the other busyness of life faded away as I stared with all intent on the perfection of the Cross and the fulfillment of so many Old Testament prophecies. Through Bible Study Fellowship, I was challenged to read straight from Scripture to my kids, instead of all of the kid's books about Easter. Don't get me wrong, they are all great books, but I do not want to underestimate the Holy Spirit's ability to interpret the Word for my kids. When our children's only source of the pretty Easter story are picture books, they tend to think of it as a pretend picture story, instead of God's true Word. Kids can make amazing pictures in their head, READ TO THEM FROM THE WORD. Below are some of the ways we really focused on the beautiful act of love Jesus did for us during this most precious week. I was convicted not to use my "Bible/Teacher Voice" when reading the Easter story. If you don't know what this is, you have not been in a preschool class recently. It is a bit higher pitched than my normal voice, and sing-songey, and the voice I use when reading pretend stories or picture books. It just felt wrong and disingenuous, and conveyed the wrong message to my kids. Passover Feast/Last Supper Read Matthew 26:17-30. Use Homemade Resurrection Eggs to further explain to young children, but I highly recommend leaving the 12th egg unopened until Sunday (see Saturday for why). Traditionally this is the day of mourning after Good Friday. On Saturday evening, before bed, we turn off all the lights for just a few moments and talked about the darkness of the tomb. When you turn it back on, tell them there is an exciting day coming where it isn’t going to be dark in the tomb anymore. SUNDAY MORNING The Resurrection Read Matthew 28:1-10. Decorate! Instead of baskets filled with candy and toys, the boys woke up to balloons and streamers celebrating Jesus's Resurrection. We decorate our house with a large He is Risen banner. It doesn't come out until Easter morning, and stays up for a few weeks! 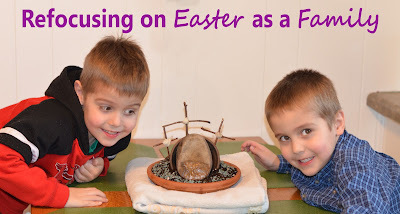 Make Resurrection Rolls as you discuss how Jesus's friends laid him the tomb, but he arose 3 days later! You use a white (pure) marshmallow (symbolizes Jesus body). 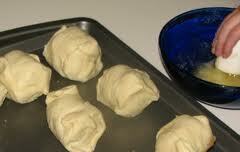 You roll it in melted butter (oils), cinnamon and sugar (spices), and then put it in crescent rolls (tomb). After baking the marshmallow will "disappear"/melt! Passover Sedar- A family in our church invited us to a Christian Passover Seder. What depth this adds to the Holy Week. We eat the same dinner our Jewish Savior Jesus himself ate with his disciples the night he was arrested. We read the book "Hoppy Passover" before to show the boys what we would be doing. It seemed silly at first, but was extremely helpful in showing what they should expect, and they did very well the whole evening. Resurrection Garden- We did a simple grass Resurrection Garden at the beginning of the week (more instructions coming in later post). The boys found sticks in the yard for the crosses. It took longer than I had hoped for the grass to grow. Next year I will buy the quick growing seeds. Other Family Devotionals- There are some great resources from Focus on the Family that we incorporated into the week.